Starting seeds yourself has fabulous advantages! Seeds are cheaper than transplants, and you can grow far more varieties of veggies than you can buy at the local nursery! You can buy the best and order the latest they may not have heard about yet. You can experiment and see for yourself. You can touch and taste these special varieties! You can even do a little research and hybridize some of your own! And you can grow them when you want them! The two main ways to work with seeds are to plant indoors or outdoors! Just like in Mother Nature, outdoor starts are blessed with whole nutrition from their very beginning and they don’t need transplanting! Before you sow your seeds, amend your soil surface with worm castings! Castings speed germination and strengthen seedling immunity. Keep that planting space and those castings moist until you are ready to plant. A couple days before planting, water the soil so it is for sure semi moist on planting day. Plant large hard seeds and seeds that are planted an inch deep before a rain. Wait until after the rain to plant little seeds that could be washed away or buried too deeply. Same for seeds that rot easily like bean seeds. Prevent pests! Put down what you use to end slugs and snails before you sow your seeds! While you are waiting for planting day, make tags. I put three things on my tags. 1) I put the planting date on the tag so I’ll know by when I should be seeing seedlings. 2) The name of the plant helps so you will know what they are and not a weed! If you are new to planting seeds, don’t worry, you will learn to recognize the little guys. If in doubt, let them grow a bit before you ‘weed’ them out. Look online for baby pictures! 3) The days to maturity cues me to when I should be expecting fruit and how well my plants did. And that varies per time of year, temps, weather, your soil, how well you cared for them. Mark your planted areas as you go! When I plant the seeds I put a stick at the ends of the row, a triangle of sticks when there is a single area where the seeds are planted. Since I do a lot of interplanting with understories, companion planting special plants where they will do the most good, that keeps me from stepping on or disturbing the seeds. Some seeds are big and fat like beans, others, like poppies and purslane, are so tiny if you dropped them you would never find them! After how far apart should I plant my seeds, probably the most iffy thing about planting seeds is how deep do they need to be planted? Most seed packs have that info on them. Chopsticks can be used in a couple helpful ways. Mark one of them at 1/4, 1/2, and 1″ on the stick. That way you can get your seeds at the right planting depth. Using your marked stick keeps you mindful; planting goes fun and faster with less wondering and worrying! If you are installing delicate sprouts, make a planting hole, and if you are good with chopsticks, grasp the sprout gently, carefully place it. Cover and smooth the soil, water gently. Check out Seed Soaking/Presprouting Tips & Ideas! Teensy seeds are a challenge in so many ways! First it’s a question of not dropping them. Hold the package over a dish? Something smooth and not wet or sticky. And keep your hands and that package dry! And don’t plant those tiny feathery seeds on a windy day! Second is how to distribute them the right distance apart. Very carefully. Be careful not to crush or damage them by rolling them or squishing them between your fingers! Use a tiny spoon. Since most tiny light seeds aren’t supposed to be buried, in nature they wouldn’t be, simply very lightly hand pat them to the soil. Third is how to keep them from washing away when you water. You can make a tiny ‘trench’ or depression with mild slopes. Sometimes I just hand pat a little depression area with my fingers. Instead of the hose, use your watering can with nozzle that has fine holes. No flooding or standing water. Just moisten. Moisten them maybe 2 or 3 times so the soil gets moist a 1/4 to a 1/2 inch deep. Moisten once, water something else, come back and moisten again so the water can soak in a wee bit deeper. Repeat. When you are weeding, have you noticed how many seeds come up by the edge of a pathway board, a plot border or a stepping stone? Put down a mini board, wide stick, where you want tiny seeds to grow, preferably in a slightly lower area, a depression that will hold a bit of moisture. Sprinkle the seeds around the board, along the stick. They will have the moisture and shelter they need to get started right at the side of the board or stick! Once they are started, remove the board, transplant some of them if you like. It may be easier to plant a group of seeds in one place to get them started. That can be their nursery. Plant them far enough apart that you can get a small trowel in there to collect them to transplant. Transplant them where they are needed or to their permanent place when they get their second set of leaves. Delicate seeds like Marigold need to be carefully laid down and cover the complete seed, but no more than 1/4″. The ‘tail’ of the seed acts like a wick to deliver moisture to the seed. Unprocessed home saved carrot seeds are fuzzy with wicks. They germinate much sooner than the processed naked ones in seed packs! Lettuce seeds are planted on the surface OR 1/4″ deep depending on the variety. Read your seed pack! Harder seeds like Cilantro can be exciting to handle since they roll around and jump for it any time they can! They often come up as nearby volunteers! That rolling about can make spacing a challenge. But you can see them and they are big enough to move where you want them. Radish are not exactly round, but they can be unpredictable too! If spacing means a lot to you, you can make or buy seed strips! If you aren’t overplanting for greens from thinning, spacing does mean a lot! Plants too closely seeded and not thinned, get rootbound, root plants like radish, beets, carrots can’t make, won’t form their roots. Too closely planting lessens growth and production, weakens your plants since your plants are literally starving. Plants along the edge of a clump can reach out. Ones at the center can’t get their roots through to food. Beet seeds are unique because each ‘seed,’ corm, is a cluster of three to four seeds! There is no escaping needing to thin them. OR, you can gently hand separate them to get four healthy plants! I separated beets I got from a nursery. When I finished 3 of the 6-pack compartments I had planted out 36 beets! Big seeds are easy, but if you aren’t naturally a good measurer, it’s easy enough to plant too deep or not deep enough! Where are those chopsticks? If the seeds are an inch deep, you usually won’t wash them away when you water. Some seeds can be planted too deep make it, just rot and become compost. With others a little deep means it just takes longer to come up. Too shallow may not keep those seeds moist enough. Some batches of seeds are mixed sizes – maybe your green manure or living mulch mix. Some say broadcasting them is all you need to do – they are light germinating seeds. But soil contact and moisture is important. If you plant during a hot spell, get your soil as level as possible. Fling, toss, drizzle your seeds about. Lay a board or a piece of plywood on the soil to press them down for that contact. Immediately cover with bird net or aviary wire or many will be gone overnight, and birds will take tiny tasty tender seedlings that sprout! Gently water your seeds to keep them moist. In hot weather that may be two times a day. You can bury your seeds, but way fewer seeds make it. You only get a thin stand. Protect your seeds! After your seeds are in, cover with bird netting or aviary wire. Birds love seeds and fresh seedlings! Animals like plowing through your soil looking for insects and seeds. Aviary wire is best for that, or an easily removed wire border so you have access for tending. You can use cloches for small spot plantings. When you can use them, they are excellent because wicked slugs and cut worms can’t get through! Successive planting in summer heat has its own challenges, but it is doable! Set up shade cloth, use upturned flower pots or laundry baskets, cardboard boxes, or lightweight fabric held aloft with hoops. Shade cloth comes in different densities. You can water through it and it keeps birds and predator insects away. Remove it when your plants are up and strong. This image has lettuce, but you can start mixtures of other plants this way too. Use it as a nursery then transplant plants where you want them. Starting seeds in a Container is a whole different territory! Your main advantage is getting a SIX WEEK headstart on planting! That’s food on your table a month and a half sooner! It can be as simple as putting a few containers or 6 packs in your kitchen window or on top of the warm fridge, or doing something costly, elaborate and sophisticated! If you like starting seeds, choosing a permanent space, then installing lighting, warmth, and setting up a special overhead watering system on a timer may intrigue you. You might put up a greenhouse! You can install a wonderful bought or homemade cold frame on the sun facing hillside. You can make your own special seed starter mix; it’s not too hard. But if you don’t want the mess, or don’t have time for that, you just buy a great mix at the nursery! While you are there, get a bag of vermiculite, or when you are at the grocery outlet, get a big container of cinnamon. Read on below…. Starting seeds indoors means there are no predator pests. Yay! Rain doesn’t matter. No drying or damaging winds. No hot scorching sun. No soil pre preps – yet. Level starting medium is pretty easy to achieve. Gentle watering is still needed. Seeds and seedlings need to be kept moist. Making tags is very useful, especially if you put different plants in the 6 pack compartments! You have a start date and you know when they should be up. And you can use the tags when you transplant the babies in the soil outdoors. When the true leaves come on, the ones after the first two, the seedlings will need to be fed. Spritzing with a liquid feed is the usual answer. The nemesis is Damping off disease, a sad foe of seedlings. The baby just topples overnight and it’s over. A 2005 North Carolina State University study found it’s not the mixture but what’s on top of the soil that counts most. Damping off differences almost disappeared between commercial organic seed-starting mixtures and various homemade mixtures after all of the seeds were covered with vermiculite instead of a planting medium. Simple fix! The super simplest prevention is Cinnamon! Just sprinkle it on the soil! Sprinkle on plant injuries and they will heal. It is a rooting hormone. And it repels ants! Mildew, mold, fungal diseases? Mix 4 tablespoons cinnamon in a half gallon warm water, shake it vigorously, steep overnight. Strain through a sieve or coffee filter and put it in a spray bottle. Add ¼ teaspoon liquid dish soap as a surfactant, lightly spritz your plants, undersides and tops of leaves! You do need to harden off seedlings. They need to be taken outside to get used to cooler temps, a bit of breeze to build their standing up muscles! The author of ‘Grocery Gardening’, Jean Ann Van Krevelen says, “Take your seedlings to a protected location outside for one hour for the first day.” She said, “Do this each day for a week. Add one hour for each day of the process. By the end of the week, you’ll be at 7 hours and the plants will be ready to be transplanted.” She doesn’t recommend direct sunlight or wind. Don’t take they out if it is windy and your seedlings could be broken. Just do it the next day where you left off. Keep your seedlings evenly moist. Schlepping them back and forth may be a challenge, but doable. But if you grow them on a cart with wheels in the garage or near the patio, you can easily roll them out and back in each day. Both indoor and outdoor planting have their necessities, special techniques, disadvantages and advantages! There’s no reason why you can’t do BOTH! Getting a healthy start in the ground is terrific! Others would never make it in cold or extreme heat and indoor babying is just right. Preseason indoor starting gets you there that six weeks sooner! MY cucumbers! Cassie lives in Indiana and usually has dirt under her fingernails. Some people LOVE Cucumbers! Dice ’em or slice ’em, put slices on your eyes, make a soothing skin cream, hair tonic! Sulphur in cucumbers helps stimulate the growth of hair and makes it thick and healthy. Although less nutritious than most fruit, cukes are delicious and good for your health in many ways. Magnesium, potassium, and the mineral silicon in Cucumbers keep your skin beautiful! The juice cleans your pores by removing dirt, bacteria and excess oil. Cucumbers have a natural cooling effect and reduce the redness, inflammation of blemishes. Their Vitamin E fights free radicals and heals scars. They treat bad breath, so you will look and smell good! Cucumbers will help heal stomach ulcers. Drinking two glasses of cucumber juice every day can cure heartburn. Cukes help reduce your blood pressure. And they lower blood sugars, helping with diabetes. Cucumber contains polyphenols called lignans, and phytonutrients called cucurbitacins. They help prevent the growth of breast, uterus, and prostate cancers. They help get rid of excess uric acid in the body and help maintain healthy kidneys and bladder conditions, even prevent the formation of kidney stones. They also help digestion and reduce constipation! Vitamin B and electrolytes in the cucumber will be useful to help relieve headaches. Weight loss! Cucumbers are 95% water and low calorie! They will help keep you hydrated and delay hunger, as well as improve your joint health and reduce bad cholesterol! Cucumbers belong to the Cucurbitaceae family, which includes squashes (including pumpkins), luffas, melons, and watermelons. Cucumbers grew wild in India over 4000 years ago and have since traveled worldwide! They have been traded by empires, eaten every day by emperors, brought to Haiti by Columbus in 1494, banned as deadly at times! In 2010 worldwide cucumber production was 57.5 million tons, with majority of the world’s production and export being located in China (40.7 million tons)! As of a 2013 article, In the United States, consumption of pickles has been slowing, while consumption of fresh cucumbers is rising! Huge Selection of Extraordinary Varieties! Sizes from itsy tiny watermelon-like heirloom Mexican Sour Gherkin AKA Mouse Melons, sandia de raton, to small bumpy pickling types, substantial juicy slicers, to longs like wonderful Chinese Suyos! Cucumbers can be green, white, golden orange, healthy bitter red orange spiky Gaks, up to 3 meter long brown Kigelias, brilliant red Dragon’s Eggs! You just haven’t lived until you’ve tried a few exotics! The different shapes are a treat! Mouse Melons, round lemon cucumbers, the standard long shapes, fat Hmongs, African Horned Cucumbers! You can get big viners, or bush type patio container types with smaller leaves at shorter intervals. Compact yet lots of production! Now we have varieties producing all female flowers (gynoecious types) that produce seedless fruit earlier have more concentrated production, a longer shelf life. No bees are needed. In experimental trials the following varieties have produced high yields and have resistance or tolerance to common diseases: Burpee Hybrid, Comet A II, Dasher II, Marketmore 80, Slice Master, Sprint 440 II, and Victory! Read the notes about these varieties! These are features you want to see when picking varieties! Marketmore 97 – 55 days. One of the best early northern cucumbers producing long dark green fruit, non bitter. This excellent slicing cucumber variety is tolerant of powdery mildew, cucumber mosaic virus and resistant to scab, providing a good crop under adverse conditions. Very dark green, looks thick skinned, bumpy. Best of all is to plant powdery mildew resistant varieties like AAS winner gynoecious and parthenocarpic Diva! BETH ALPHA – 58 days Heirloom. The original Middle-East type. Often a parent for the wonderful high-end Slicing hybrid cucumbers. Probably the best all round cuke. Early, productive over long season, mild. Thin skin, wonderful taste with no ‘bitter ends’. If your area has short cool summers, go for early, cold tolerant, smaller fruited varieties, container types. In hot areas, enjoy those big slicers and Japanese longs! Sometimes heat and drought go together, or you would just like to save water. Here’s a great page at SFGate that lists six heat tolerant varieties with all their details! Little Leaf H-19 (parthenocarpic) and Suyo Longs are terrific! Ashley withstands heat and has good downy mildew resistance. Your climate, soil and many, many other factors determine how well plants grow together. I’ve seen gardeners make exact opposite claims with the pictures to prove it. Bottom line is try things for yourself! Companion plants enhance each other’s growth, repel pests! Adding companion plants adds a whole new dimension to planning your garden! Spacing changes. Locations change. Your plants are healthier, there is more production, your growing season is extended. By intermingling companion plants, biodiversity happens naturally. For example, rather than having a separate herb area, spread them throughout your garden. Put those herbs to work beside veggie plants they help and favor! Plant 4 or 5 plants with an herb at the hub of the wheel! The herb will serve all those plants at once! Cucumbers & Dill! This is a companion combo based on timing and usage! Plant Dill at the same time as your cukes, and with your cucumbers so they will mature at the same time for pickling, probiotics, and you have convenience of harvest! Another natural combination is basil and tomatoes! A super spatial combo is trellising Cucumbers below, letting pole beans grow up, through and above the cukes! RADISHES get the gold star award! They repel a variety of beetles, including the nasty disease carrying Cucumber Beetle! Plant Radishes, followed by Cucumbers so the radishes will be up and running when your cucumbers need them! Let the radishes grow out. It’s not like you are planting a crop of radishes there. You want them to mingle among your cukes. You won’t need very many radishes to do this. If you didn’t get them in before planting time, get them up and growing ASAP! Other helpers! Basil or summer savory, and dwarf marigolds, can mask cucumbers from cucumber pests like striped or spotted cucumbers beetles. Potato, super aromatic herbs like Sage. First decide how you will grow your Cukes! On the ground, trellising or overhead?! That determines how you layout your garden! Overhead may require separate additional space, or you might install it over your patio but not so tall that you can’t reach to harvest! Unique! Trellises will make varying kinds of shade depending on what kind of trellis you use. You might like some shade for summer lettuces. A simple vertical trellis still makes shade, but less if you install it along the direction of the summer sun’s path! If you have already planted other plants and don’t want to shade them, you might choose smaller varieties of cucumbers that will grow to less heights, have smaller leaves. Small pickling cucumbers are easy on a vertical trellis. If you are growing heavy slicers, a vertical trellis is still good. If you are growing a LOT of long cukes, you might grow them on an overhead, let them hang for easy harvesting. Cucumbers up on trellises will ripen all the way around while ground growing might leave an unripened yellow area on their down side. Choose trellis shapes that give you easy picking access and that will give ample space for the variety of cucumber you choose! Getting your cucumbers off the ground keeps them out of the nibbling insect zone, but it is a little cooler up there and may delay growth a bit. If you are in a cool windy coastal area, you might decide to grow low shrub porous windbreaks to shelter an area, and leave your cukes on the ground. Mulch with only an inch layer of straw to keep them off the ground and the insects happy under the mulch. The thin straw layer allows aeration and some light through to keep the soil warm. Full summer sun! Cucumber is not a ‘winter’ plant, they grow best at 81 F to 101! They will do alright at 60 degrees at night, and above 70 degrees during the day. If you are coastal cool, if possible, find a SHELTERED spot for them so they can be good and warm! In the garden plant them on the sunny side of corn, beans or tomatoes. Look for a light colored wall, west facing, with no chilling wind that whips by. A light, sandy loam soil works well for early production. Cucumbers thrive in well drained, fertile soil and need a pH above 6.0. Some northern gardeners prepare their cukes, melons, squash, peppers and tomato soil well in advance, in fall for spring! They compost in place – pile on manure, chopped leaves and grass, sprinkle on coffee grounds and kitchen scraps, wood ashes from winter fires, etc. In spring dig a foot square hole, fill with your luscious compost, plant your seed right in that compost! Lasts all season if you live in a short season area, and no compost is wasted where no plant is planted! As long as you get that compost out to just beyond the feeder root area your mature plant will have, it’s good. Incorporate a layer of worm castings at the top of your planting area if you are planting seeds. Castings improve and speed germination, improve water holding capacity to keep your seedlings moist longer! Spacing depends on which varieties you plant and whether you trellis or not. For trailing cucumbers on the ground, plant 3 to 4 seeds in hills, spacing the hills 3 to 4 feet apart in the row and space rows 5 feet apart. If you plan to trellis your cucumbers, space the hills 2 feet apart in the row and thin to one plant per hill. If you use a vertical trellis, as your plants grow, be prepared to gently weave them up the trellis or tie them in place. Cukes are not like beans or peas that do it by themselves and bend easily. Hilling or Basins?! If you live in a wet summer rainy area, hilling is great for drainage, though sometimes toward the end of summer, salts accumulate on the top of the soil and water simply runs off. Or the hill flattens from watering, roots are exposed, you need to replenish the soil. Laying on compost mulch covered with a straw mulch will help that. In hot Mediterranean summer dry areas like SoCal, a dripline-wide basin corrals the water right where your plant needs it. Put a stake in the center of the basin so you know where to water. If your soil is infected with wilts or blights, make a hill, put the basin on top, with the bottom of the basin above the regular soil level. This waters your plant, allows drainage and some drying, reducing the fungi. Mulch with only 1″ of straw to allow airflow, but to keep leaves from touching soil. Cucumbers are frost tender. Wait to plant until the soil has warmed up to 65° degrees or above. Pre sprouting is smart! Soak your seeds in water for 5 to 10 hours, drain. Put them on damp paper towels wrapped loosely in an unsealed plastic bag and put in a warm spot. 70-85 degrees is optimum. Check the bags every day – keep the towels moist. The seeds will sprout in a few days. It saves time and guarantees you will have a plants in every space! You won’t waste time waiting for failed seeds in the ground. Seed Soaking/Presprouting Tips Plant your sproutlings very gently. Selecting Transplants to save money! Not everyone wants to plant from seed! Not everyone wants to spend a ton of bucks on transplants either! Ok, so do it John Kohler style! See this video of him separating out ELEVEN lemon cucumbers from one 4″ container he purchased for $1.79 – those were the days, ha, ha! I didn’t believe it, but he did it easy! And I’ll bet they all grew! You can use this technique with many plants. Tag your seedlings and transplants with the date planted, variety name, # of days to maturity. Having your plant date and days to maturity tells you at a glance how well they are doing per how long they have been in the ground. If your seeds don’t germinate, you know your seed is compromised or too old. If there are no fruits when expected, are you over fertilizing and your plant is going to leaf and no fruit, or are they slow due to cooler weather than usual? When the season is done, how did that variety do for you? Should you save some seeds? Put a note in your records of what to do better next year, for selecting next year’s purchases, how many to plant. Also, jot down where you got that transplant or the seeds. If you are planting non gynoecious types, all female flowers, not to worry if first flowers don’t make baby cukes! Male blossoms come first so they can fertilize the female blooms unless you have an all female no pollination needed gynoecious and parthenocarpic variety. Cucumber vines will produce the greatest amount of female flowers when day length shortens to approximately 11 hours per day. Plant a round at the time you can hit that window! If you have poor or fungi infected soil, two plantings may make sense. The first planting may not last long depending on whether you planted a resistant variety or not. A later second planting, when the soil has heated and dried, may be more successful. To help keep the soil drier, use an open mulch like straw, only 1″ is best, for airflow. Planting smaller shorter fruited varieties is good early on. A month or two later you might plant long varieties that need good heat to make those big babies! Cucumbers have short roots and need consistent water, kept moist, to never dry out. Pick first, water afterwards. Avoid wetting the plants and water in AMs if possible to avoid mildew. Plant mildew resistant varieties like Diva. Apply your baking soda mix to alkalize the leaves.Some say most granular fertilizers leach from the soil rather quickly due to watering. That is why the instructions say you should reapply periodically through the season, even once a week. Time release pellets do better. But adding organic material, compost, to your soil not only adds nutrients, it loosens the soil, attracts worms and other soil building critters and helps your soil retain moisture and nutrients. Feed your cukes when they first begin to run (form vines and sprawl); again when blossoms set. A big vined short rooted, long fruited variety of cucumber, in a long summer is a heavy feeder, so some gardeners recommend to fertilize once a week! A small fruited, small leaved patio type container cucumber may need little to no feeding. Since Cucumbers are short rooted, be very careful if you dig in fertilizer or compost. Dig only on one side so as not to break off all the tiny surface feeder roots. Better to add a 1″ layer of compost, some worm castings if you have them, in the planting basin, cover with straw and water well. Foliar feeding mixed teas feeds the whole plant with no harm to the roots at all! Do both the compost and foliar! Fruits will be aborted during dry spells and very hot weather. Keep your plants watered, moist, regularly, and don’t worry if your plant temporarily stops flowering and producing. When the weather cools, you will be back in business! Bill Finch has written a detailed, educated and humorous account about using summer horticultural oil on whiteflies! It’s worth the read. Most cucumber varieties will start to bloom in about 60 to 65 days after they germinate. They have male and female blooms on the same plant. Only the female bloom produces fruit. Insects are necessary for cross pollination. Grow lots of bee food! If it is necessary to apply insecticides it is best to apply them as late in the afternoon as possible, when bees are less active. Parthenocarpic varieties having all female flowers, don’t need bees. Mexican Gherkins/Mouse Melons, are ripe when they fall to the ground! Lemon cukes are best eaten while still young and pale green. Other Cucumbers mature rapidly and once in production check every other day for ones ready to harvest. No storing on the vine or your plant thinks it’s done and stops producing. Cut, clip or carefully twist off while holding the vine. Cukes are old if they are large, puffy, dull and yellow. Use care not to step on vines during harvest. Pickles are the only real way of storing cukes, and there are the cuke varieties that are specific for that purpose! Probiotic pickling is the healthiest way of doing it. Cucumbers are another room temp veggie. University of California, Davis, says cukes are sensitive to temperatures below 50°F. They thrive and last longer at room temp. However, cucumbers, eggplant and peppers can be kept in the refrigerator for 1 to 3 days if they are used soon after removal from the refrigerator. If you are in a short summer cool climate, don’t have a long enough summer to save seed, buying seed may be your only option. Parthenocarpic means your plant produces without pollination, makes NO seeds. Like with hybrids, saving seeds is not an option. However, there are reports of saving seeds from parthenocarpic plants! Some flowers do get pollinated. Soak the seed like usual, keep only the sinkers that look the most like your original seed! You might not get many, but probably enough! If you have non parthenocarpic varieties and want to save cucumber seed, plant only one variety! They cross breed like crazy! Experienced home seed savers can grow more than one variety at a time in a single garden by using hand pollinating techniques. If you don’t hand pollinate, separate two different cucumber varieties by at least 1/2 mile to ensure purity. Inbreeding Depression, reduced vigor due to breeding related plants, is not usually noticeable in cucumbers. Seeds should be saved from at least 6 cucumbers on 6 different plants. You may ask what if I plant non and Parthenocarpic varieties together? Parthenocarpic cucumbers grow fruits without pollination, developed for commercial greenhouse production – no bees. As a home gardener, if pollinated they will have seeds. If you don’t mind seeds, then interplanting is not a problem. But these seeds will be hybrids. Experimenting can be fun, or disappointing if you want what you had before. Saving the seeds of Cukes, Eggplant, Melon, Pepper, Squash, Tomatoes, and Zukes is super easy. Leave the best or last of your cukes to get old on the vine to reap all they can from the Mother plant. Leave them at least 5 weeks after the eating stage, until they have turned a golden color. Now is the time we want those old large, puffy, dull and yellow ones! In northern areas the first, light frost of the season will blacken vines and make cucumbers easier to find. Undamaged fruits can be stored in cool, dry place for several weeks to finish ripening. Slice your cucumbers lengthwise and scrape seeds out with spoon. Put them in warm water no more than two days. Scrape any scum off. Let the contents settle and begin pouring out the water along with pieces of pulp and immature seeds floating on top. Viable seeds, sinkers, are heavier and settle to the bottom of the jar. Repeat this process until water being poured out is almost clear and clean seeds line the bottom of the container. Pour these clean seeds into a strainer that has holes smaller than the seeds. Let the excess water drip out and invert the strainer onto paper towel or piece of newspaper. Allow the seeds to dry completely (usually a day or two). Break up the clumps into individual seeds, label with date and variety, store in a packet or plastic bag. Check them in a week or two to be sure there is no mold or any insect infestations. The drier the seeds, the longer they will store ~ about 5 years for cucumbers, 2 – 10 maybe. Cucumbers are easy to eat! Some cucumbers simply never make it home from the garden. Next best fresh is in a tasty greens salad! Eat cukes and yogurt! Raita, an Indian dish, is pretty and a very nice cooling summer dish. It can also be used as a sauce over falafels, as a veggie dip or salad dressing! Chicken, lettuce & cucumber slice sands! Make a pale green egg salad with fresh minced basil, green onions, and crunchy cucumbers. Tuck it into pita pockets. Mmm….. In Asia cucumbers are often stir-fried and are quite tasty. Give it a try! Toss cold noodles with sauce, cucumber, and scallion or coriander. Sprinkle noodles with sesame seeds. How about a delicious Pineapple Cucumber Smoothie?! Add blueberries for blue, Strawberries for pink! Or do Cucumber, Apple & MInt! With Kale. Watermelon! Do a flavor a day – just add Cucumber! Add cucumber, pineapple, frozen banana, light coconut milk, water, lime zest, lime juice, greens, and ice cubes to a blender and blend on high until creamy and smooth, scraping down sides as needed. Pickles are prime! Do probiotics for the very best nutrition! Add carrot sticks, hot peppers, garlic, dill, whatever tickles your tastebuds! FYI the inside of a cucumber can be up to twenty degrees cooler than the outside temperature! This is where the saying cool as a cucumber came from. Quick Guide to Summer Veggie Soil & Temp Preferences! The graph above is of best soil temps for seed sowing! And even then, some seeds are more cold or heat tolerant, so get enough seeds to try again should there is some kind of fail. Challenging conditions can be shady areas, or if you are intermingling veggies in your landscape, areas shaded by permanent ornamental plants. Transplants are already up and more hardy, sun reaching sooner, so your wise choice may be to start with transplants, not seedlings started outside. If you are container gardening, move your container to follow the sun during the day. Use one of those little plant dolly thingies if it is a heavy container. DARK AND LIGHT-SEEDED BEANS: Dark-seeded beans are more resistant to rotting in cool soil than light-seeded beans. Beans need a minimum soil temperature of 65°F to germinate well, otherwise rotting may occur. Beans are crazy to grow! They will give you a good crop in soil that’s loamy, sandy, rocky, rich or poor and even in clay as long as it has good drainage. They do prefer slightly acid soil. Though beans do need regular water for their short roots, still, avoid planting them in shade with soil that stays wet. When growing beans in a new garden site! Special tip from Bountiful Container: ‘With inoculant, the critical bacteria that enhance the plant’s ability to convert Nitrogen from air into N in the soil, are added to the soil. Either powder the inoculant on wet seed or sprinkle granules in the soil along with seeds. Grow stronger, produce more beans.’ Even simpler, if available, scatter a few spadesfuls of soil from last year’s bean patch into new planting sites. Beans like days to be at least 70° and nights to dip no lower than 40°. It’s worthwhile to wait until those conditions are met. Otherwise, you’ll have spotty germination and stunted, spindly plants. Beans grow so quickly that waiting for ideal temperatures will be worth some patience. Warm, light, sandy loam soils are preferred for early production. Compost and composted manure is good. Cukes like moist well drained, fertile soil and need a pH above 6.0. A farmer says: Apply 6 to 10 pounds of fertilizer for each 100 foot of row, using care not to bring fertilizer into contact with the seed. 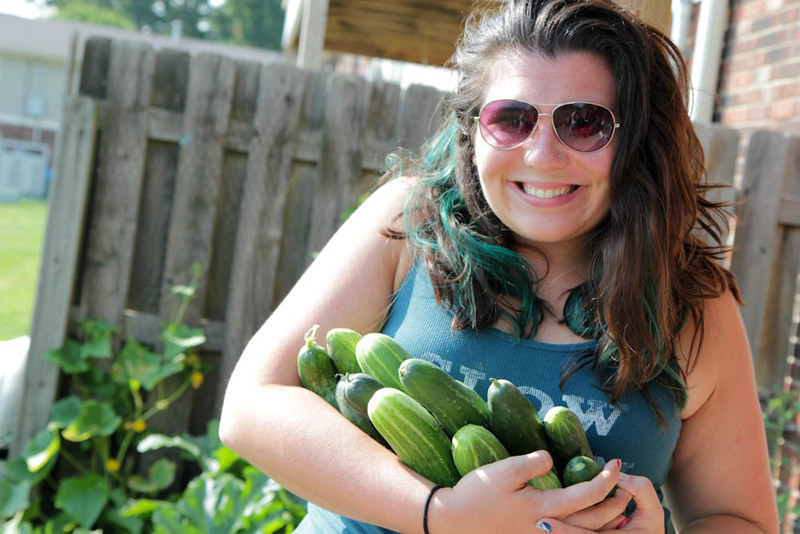 A home gardener says: When I plant cukes, I dig out a hole, about a foot square, fill it with compost, and plant my seed right into the compost. No fertilizing the rest of the season and you’re not wasting fertilizer in soil between plants that the roots never touch. A tropical vegetable, cucumbers thrive when the weather is hot and water is plentiful. If the weather is unseasonably cool, wait a while to mulch until the ground is warmed by the sun. Sow seeds directly in the garden when daytime temperatures are at least 65° to 75°. They are frost tender and should not be planted until the soil has warmed up to 65°, some say 70°! Cukes grow well in daytime temperatures in the 70’s, best at 81° F to 101°. Mini FYI: The inside of a cucumber can be up to twenty degrees cooler than the outside temperature. This is where the saying cool as a cumber came from! Wherever you plant them, the key word for eggplant soil is ‘rich.’ Sandy loam or loam is lovely. Eggplants are greedy feeders; ideal eggplant soil is well-drained, rich in organic matter, including lots of well-rotted manure, and has about a neutral in pH. During the season, sidedress with extra compost. Keep the soil moist to promote maximum growth. Eggplant do NOT thrive in very humid areas. Pollination is difficult when the weather conditions are very wet, overly humid or excessively hot. The minimum soil temp needed for seed germination is 60° F. The optimum range is 75-90° F.
Transplant at soil temp that is minimum 65°F. Place transplants in the garden slightly deeper than they were in their pot. Cold soil will shock the plant and set it back several weeks. Eggplants are more susceptible than tomato plants to injury from low temperatures and do not grow until temperatures warm. They like temps to remain above 68°, 70° to 85° F is even better. Critical temperature for setting out eggplants isn’t the daytime high, but the nighttime low. Cool evenings will set back the seedlings’ growth and make them more susceptible to diseases. Wait until the evening temperatures are above 65° before putting in seedlings. Cold temperatures will stop plant and root growth reducing plant vigor and yields. If your crop is still producing in the fall, cover them on cold evenings to extend the harvest. Don’t be in a rush to mulch. Mulching too early in the season keeps the soil cool, resulting in slow growth, poor fruit set, and shallow rooting. PEPPERS, either hot or bell, need VERY RICH SOIL, are heavy feeders! Place compost, worm castings, rotted manure under them when transplanting. Mix in 1 T Epsom Salts, Maxi Crop, Landscape Mix. Sandy soils are preferred for the earliest plantings because they warm more rapidly in the spring. Heavier soils can be quite productive, provided they are well drained and irrigated with care. Rather than in the soil, do foliar Epsom Salts! A cheap home remedy that can keep plants greener and bushier, enhance production of healthier fruit later in the season, and potentially help reduce blossom-end rot. Apply 1 tablespoon of granules around each transplant, but research has shown a foliar spray of a solution of 1 tablespoon Epsom salts per gallon of water at transplanting, first flowering, and fruit set is more effective! As a foliar spray, Epsom salts can be taken up quickly by plants, otherwise, it is sometimes hard for the plant to get it out of the soil because of calcium competition. Peppers are Temp Particular! Hot peppers grow best in daytime air temperatures 65° to 85°F. Transplant when night time temperatures stay above 50°, 55° is better. Below that plants grow very slowly, have yellowish, puckered leaves, and look sickly, often don’t recover. Night temps between 60° and 70° are best. In temperatures greater than 85°F, peppers may drop their blossoms although set fruit will ripen. The ideal temperature for peppers is a daytime temperature around 75°F and a nighttime temperature around 62°F. At soil temperatures above 65°, pepper growth accelerates. Plants may become stunted and never recover if either the soil or air temperature is much below 55°. Nighttime temperatures below 60° F or above 75° F can reduce fruit set. Plumping up! Gardeners in hot regions will need to be especially patient with big bells and sweet roasting peppers. Both of these tend to wait until the nights are longer and cooler in late summer before fruiting and plumping up. These folks may want to plant banana peppers or sweet non-bells, which will ripen in time to use with those bumper crops of tomatoes and basil. Peppers need time on the plant to absorb nutrients and water and plump up their flesh, so pack your patience. Color Changes! Mother Earth News says: After reaching their maximum size, green peppers that are meant to turn red, will develop red pigments in 10 to 28 days, if daytime temperatures are between 65° and 75°. In southern regions where temperatures exceed that range, peppers turn yellowish and may acquire an off-color pallor that is not attractive. Below the optimum temperature range, color development slows dramatically; below 55°, it stops completely. If soil temperatures drop below 68°, pigment production declines and eventually ceases. SQUASHES grow best in full sun! They like rich well-drained soil, high in organic matter, and require a high level of feeding. Zucchini, in particular, produce a lot and get hungry! Days need to be at least 70° and nights to dip no lower than 40°. Summer squashes grow best in air temperatures ranging from 60° to 75°F. Plant in a warm soil. If the soil is below 60° F, summer squash seeds are more likely to rot in the ground before sprouting. 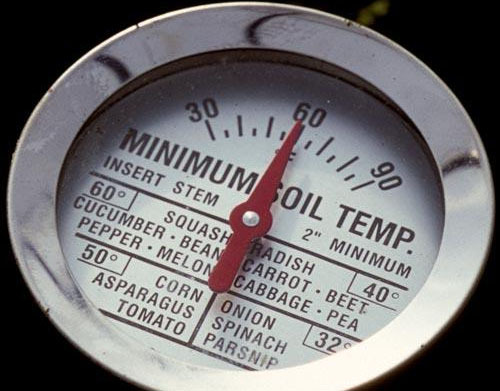 The ideal soil temperature for germination is 70-90° F. A doable temp is 65-70°F. I add a good dose of animal manures and compost, and my usuals to the planting hole –- a huge handful of bone meal – for later blossoms, a handful of non-fat powdered milk – for the immune system, worm castings – immune system, a tad of coffee grounds. This robust combo works well. As they decompose, coffee grounds appear to suppress some common fungal rots and wilts, including FUSARIUM! Go VERY LIGHTLY on the coffee grounds. Too much can kill your plants. It was found in studies, what worked well was coffee grounds part of a compost mix, was in one case comprising as little as 0.5% of the material. That’s only 1/2 a percent! True, tomatoes are heat lovers, but per the University of NV, temperatures over 104° F, for only four hours, causes the flowers to abort! If you expect high summer temps, plant heat tolerant (“heat set”) varieties: Florasette, Heat Wave, Solar Set, Sunchaser, Sunmaster, Sunpride, Surfire. When temps are out of your tomatoes’ happiness range, they abort fruit set and go into survival mode, stop production. That’s why your plant may make no tomatoes for a period of time. Don’t think it is a quitter and pull it. It will start up again when temps lower. High nighttime temps are even worse than high daytime temperatures because your plant never gets to rest. In the spring, wait until nighttime temperatures are reliably above 55° F or protect your plants with a cover at night. With your Soil Thermometer, and good gardener self discipline, get your seeds and plants in the ground at their most productive times for your location! Here’s to super tasty abundant harvests! The Green Bean Connection started as correspondence for SoCal Santa Barbara CA USA Pilgrim Terrace Community Garden. All three of Santa Barbara city’s community gardens are very coastal. During late spring/summer we are often in a fog belt/marine layer most years, locally referred to as the May grays, June glooms and August fogusts. Keep that in mind compared to the microclimate niche where your veggie garden is. Bless you for being such a wonderful Earth Steward! January, February Veggie Seeds or Transplants, Pros & Cons, Tips on Why & When! Do both! Seeds and transplants! Here’s why and when! If you are late planting seeds, it’s off to the nursery for transplants! Some plants just don’t come in six packs, like radish. Seeds it is. Watching seeds sprout and seedlings unfurl and grow is divine! It’s a miracle! Many have just never done it and find, to their delight, how easy and inspiring it is! Seeds can be started indoors at home or right where you want them, in the garden! The beauty of seeds is you can select plants your nursery doesn’t carry! You can start them indoors 6 weeks earlier than you can plant seeds in the ground! If you planted it right in the ground, you have saved yourself the step of transplanting! Some plants just don’t like to be transplanted! Annuals, plants with large seeds, plants that require weathering, plants with fragile root systems and root crops – beets, carrots. Like snapdragons, nasturtiums, spinach, and peas. Root crops like carrots need depth. If their tap root comes in contact with the bottom of a container it will fork or bend. Better to sow directly in your soil. Plants that are quick to germinate, get up and get strong, are great to start from seed, like radishes, beans, peas, beets, and turnips. If you are growing a lot or in succession, seeds are the most inexpensive way to grow your garden. Save seeds from your best veggies, flowers and herbs each year and you won’t need to buy any more! Plus they will be adapted to you and your soil! Be prepared to thin your seedlings, which means pulling out a few plants so your crop is spaced apart enough. Beet seedlings need 2-4 inches apart, but the seed grows in fours, so each plant needs room to make a normal-sized beet. Crowded plants compete for light, water, and nutrients. Also, lack of airflow will encourage diseases. The pro here is those young tender seedlings are perfect in salads! Seedlings thinned from over-crowded areas may be moved to fill in bare spots. Growing seeds for transplants indoors are protected from the elements and garden pests while you can also control soil, moisture, fertility and heat. You can select only the strongest seedlings to transplant. All your plants are up when you plant them – no germination failures, empty spaces, no wondering, no replanting necessary, no lost time. If you complete the circle by continually keeping the seeds from open-pollinated plants in your garden, you’ll create a vegetable strain (AKA: landrace) that thrives in your particular environment. There is well deserved pride in growing your veggies from seed-to-plate! Veggie Seeds Soil Planting Temps! Seed Soaking/Presprouting Tips & Ideas! Seed germination in the ground isn’t guaranteed. You wait to find out and if it doesn’t start, you lose time, possibly it gets beyond the planting window and it was not a plant your nursery carries. Starting a few seeds indoors as backup is wise. The number of days to germinate in your garden could be very different than those given on a seed packet due to soil conditions, weather, whereas with a transplant, there’s no guessing. Seedlings need to be weeded so they aren’t overgrown. Sometimes seedlings need protection from birds, pests – especially slugs, and freezes or hot sun. Right watering must be done, you can’t miss. Tomatoes like moving air to development well, if starting indoors you may need a fan. Yes, there is a learning curve with seeds. Research is important so you can choose the best for your climate, soil and light conditions, the season – first and last frosts. You’ll need a seed germinating space. Regular shop lights are fine for germinating seeds, but there usually is an initial investment of some kind, like maybe that fan! Oh it’s so much fun to select transplants! It gives you the option of trying new plants, varieties, sometimes getting another one if one has failed. While you are shopping, there are marvelous other gardening tools, amendments, flowers you can get! Who knows what you will come back with?! And you can plant in the garden the same day! Nursery transplants take a whole lot less time! You just go get them. If you don’t have a place to grow seeds, transplants from the nursery are terrific. You can ask, they may be able to get special varieties you would like. Some plants are just plum hard to get started from seed. A transplant is perfect, thanks. Starts are especially perfect for beginning gardeners who would like to skip the part that includes vulnerable, infant plants. Starting and babying tiny plants may not be your cup of tea either! Let the experts do it! With transplants the seed is germinated, it’s showing vigor and chances for a successful garden are more likely from the outset. This is particularly important when you have a limited number of warm summer days or you are planting late! On average, transplants give you a SIX WEEKS jump start on the season, because they will mature sooner and give you an earlier harvest. Transplants give higher early yields, and, one gardener says, in the case of watermelons, give larger fruits. Transplants can give you a great boost with succession planting, which means planting the same thing several times per season to ensure continuous harvest. For great results with lettuce, for example, you can start your first succession via transplants, and then follow every 2-3 weeks with lettuce seeds sown directly into your garden. If your seeds have failed, you can get transplants at the nursery! Transplants can be more resistant to insect pests, because they are more mature and stronger when you first put them into your garden. Many insect pests, like slugs, just love teeny tiny seedlings. Put down Sluggo or something like it even before you transplant, but definitely at the same time you install your plants. An overnight slug fest can remove an entire plant! Planting transplants gives you immediate satisfaction. Who doesn’t love starting their garden and seeing all those baby plants? Buying transplants can be more cost effective, and provides you with a great way to support local farmers and garden centers. Conscientious local nurseries carry starts that are grown specifically for your area. So you don’t have to worry about planting a variety that doesn’t do well in your zone. Box stores are less likely to be region specific. Having strong, young plants gives you some leeway per correct planting times. Transplants can be put in the ground earlier than seeds can be planted! If you miss a planting window, go get transplants from the nursery and you are back on time! Start 6 weeks before safe outdoor soil planting temps. Head start! Sow seeds indoors during cool weather, harden off, then move outdoors, when weather warms up, not before. Since the seedbed produces many more plants than needed, choose only the very best plants! Reduce loss. The disease and pest free, precise environment of indoor planting is more protected than seeds germinated and seedling growth in the ground. You can plant exactly as many as you need. You know they are organic all the way, seed and soil, feeds. Importantly, if you are growing your own transplants indoors, harden them off well. Expose them to slightly cooler temps and some dryer conditions before putting them out. Most transplants have been raised in warm, favorable temperatures, spoiled with plenty of water. They may suffer transplant shock from suddenly changing those conditions. They may wilt or even die with cooler night temperatures, lots of temperature fluctuation, or drier conditions. Starts from the nursery are the most expensive way to plant a garden. Prices can vary drastically depending on where you shop. There is a carbon footprint. Yes, most do use plastic containers and you usually drive to the nursery. Your variety choices are limited to the plants the nursery or garden center selects from their grower, which may be local or not. Box stores often carry out of season veggies for your locality. You have to buy more than you need, they only come in four or six packs. The nursery runs out or doesn’t have as many as you need or the plants aren’t in good condition. Consider that transplants can introduce weeds, pests and diseases into your garden. Most producers of transplants are very careful about this, especially with respect to diseases, but it is not uncommon to get a little grass or other weed seed into your transplant pack now and then. Carefully check for pests, the undersides of leaves. Transplants you start yourself are time and labor intensive, and sometimes the whole batch fails. For more assurance, plant backup seeds every few days. If you end up with too many, share them with other gardeners who will be so grateful! Veggies easy to direct seed – that’s right in the ground! Tomato grows rampantly from seed! Veggies to transplant or start in trays or get at the nursery! Tomatoes are fun to get at the nursery because there are often so many exotic varieties! In Santa Barbara, that nursery is La Sumida! Know that different gardeners do better with one plant than another! Their peppers always do well, they never get eggplant! Their onions never get big, but they get super big juicy celery stalks! I have a soft spot for volunteers! I love the variety, surprises the birds bring already fertilized and ready to grow! Plants that self seed are a gift! They know where to grow and come up at the perfect time. Let your plants live out their life cycle, make flowers for the bees, butterflies and beneficial insects, seeds for the birds, before cleaning up. Leave a few of your very best tomatoes and cucumbers to decompose in the garden. Let sunflowers, calendula, violas and other annuals drop their seeds and make pretty next year. These plants will have natural vigor. Transplant them to your convenience if you must, but let them grow as they naturally are whenever possible. 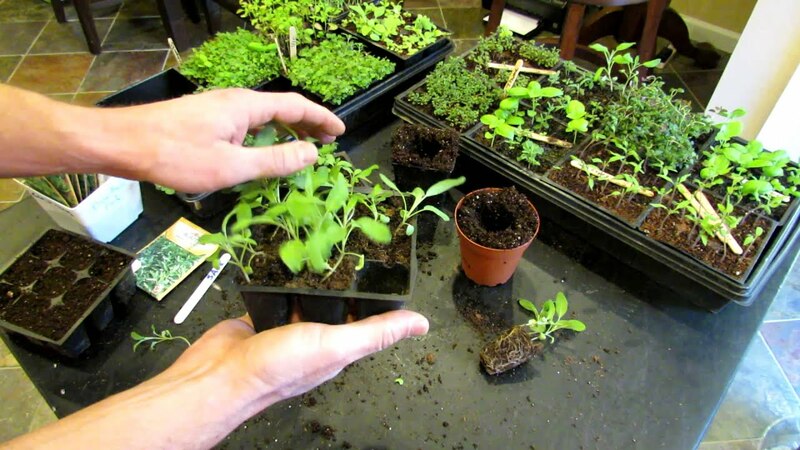 Experienced gardeners do a little seed planting in the ground, some grow their own transplants indoors, and at times buy transplants for various reasons! Maybe the nursery got a new plant and you gotta try it! February – Final Plans, Preps, 1st Spring Plantings! Calendula ~ Edible, Medicinal, Good for Your Garden, Easy to Grow! Events! CEC EARTH DAY Celebration 2017! The Green Bean Connection started as correspondence for SoCal Santa Barbara CA USA Pilgrim Terrace Community Garden. All three of Santa Barbara’s community gardens are very coastal. During late spring/summer we are often in a fog belt/marine layer most years, locally referred to as the May grays, June glooms and August fogusts. Keep that in mind compared to the microclimate niche where your veggie garden is. Bless you for being such a wonderful Earth Steward! Fine stout strong cherry tomato seedling grown by Jessica of Bountiful Backyard! You went to the Seed Swap, have gotten your seeds from the catalog or nursery, and are itching for the right temps to plant! Planning now is important because not all spring/summer plants are installed at the same time. Planting in the right places now makes a difference. Zucchini, cool tolerant tomatoes, cherry tomatoes, and corn can be started now, by seed, in the ground. March is a little warmer and early variety plants get a better start. April is most everything – cucumber, pepper, squash, beans, more tomatoes, watermelon. May is the true heat lovers, cantaloupe, okra (June may be better yet), eggplant. Some gardeners wait to plant tomatoes until May and June to avoid the soil fungi of earlier months. I hold that space by planting something temporary there in March. June is good for okra, eggplant and long beans! Summer garden planning tips emphasizing needing less water! Companions! If you are not going to be canning, indeterminate tomatoes are the excellent choice! These are the vining tomatoes that produce all summer! This saves time and water because determinate, bush tomatoes produce quickly, all at once, then you have to replant and wait for more production. determinate toms do produce sooner, so for an earlier table production, plant them to hold you until your indeterminates are producing. Also, for earlier production, plant cherry tomatoes! Yum! Basil is great with tomatoes, and a pack of dandelions! Choose more prolific plants and varieties of them so you get more production for less water. Plant tall plants to the North unless you anticipate a scorching summer. If you think it will be HOT, plant tall to the west to shade shorter plants, keep your soil cooler, use less water. Plan to put cucumbers up on trellises to keep them disease free and clean, and so they ripen evenly all the way around. Co-plant with beans! Beans above, cukes below. Japanese Long cukes give a generous supply per water used! Next, intermingle mid height plants, bush beans, determinate tomatoes, tall peppers like Big Jim Anaheim or Polanos, zucchini – try the prolific heirloom, star shaped Costata Romanesco! Potatoes with Zucchini to repel squash bugs. Plant Radish ahead of cukes & zukes to repel cucumber beetles. Eat a few, but let several grow up by and through the plants you are protecting. Leave a winter broccoli or two for salad side shoots. Mulch well under your brocs right now! We want to keep these cool loving plants in cool. They help repel cucumber beetles, so push the mulch back, plant cucumbers underneath them. The mulch does double duty, keeping the cukes clean off the soil and insect free above the bug zone! Leave a couple of winter kale to provide over summer. Heat tolerant 1000 Headed Kale is a prolific choice that harbors less aphids on its FLAT leaves. Plant lettuces on the sunny side under your brocs and kale. Snuggle eggplant among tall chards, maybe some curly leaf kale! Radishes with eggplants/cucumbers as a trap plant for flea beetles. Lowest are the ‘littles’ or fillers! Mindful of companions, scatter beets and carrots, lettuce, radish, here and there among, alongside, under larger plants on their sunny side. Bunch onions away from beans. Some of them will be done before the bigger plants leaf out. When the bigger plant leaves start shading out the littles, harvest strategic large lower leaves. There isn’t really a need to allot separate space for littles except strawberries! They need a separate patch with more acidic soil to keep them healthy and be more prolific producers! If you love cabbages, plant a few more, but they take up a fair footprint for what they produce and they take quite awhile to do it. Plant quick maturing mini varieties. SEED SAVING SPACE! Leave room for some arugula, cilantro, chamomile, a carrot or two, and a celery to go to flower to bring bees and beneficials! Besides being beautiful and having lovely scents, let them seed out for seeds for next plantings. Carrots love being with cilantro and chamomile! Pumpkin, melon, winter squash vines require some thoughtfulness. Pumpkin and winter squash vine leaves get as huge as healthy zucchini leaves, easily a foot wide! Mini melons have dainty 2″ wide little leaves, can be trellised, are definitely low to the ground, can be quite smaller than strawberry plants! A healthy winter squash vine can easily be 3′ to 4′ wide, 30′ long plus side vines, and produce a major supply of squash! You can use them as a border, as a backdrop along a fenceline. In SoCal, unless you are a squash lover, or won’t be gardening in winter, there is question as to why you would grow winter squash at all. Greens of all kinds grow prolifically here all winter long, giving a fresh and beautiful supply of Vitamin A.
Super use of your space! As winter plants finish, in spaces needing to be held for later, ie if you are planting okra in June, grow plants that are quick and prolific producers grown for their leaves, until it’s the right time to plant those heat lovers! They produce continuously, and can be removed when you want the space. You will have lush harvests while you are waiting. Think of kales, chard, lettuce, beets, crops grown for their leaves, even mini dwarf cabbages. Perhaps you will leave some of them as understory plants and plant taller peppers like Poblanos or Big Jim Anaheims, and tomatoes among them. When the larger plants overtake the understory, either harvest the smaller plants, or remove or harvest lower leaves of larger plants and let the smaller ones get enough sun to keep producing. Hardly anyone can resist planting early tomatoes! In this early cooler time, plant your leafies to the sunny side of where the toms will be planted. Pop your tomato seeds in when soil temps are good, or put your transplants in as you get them. That way you have table food soonest and your heart is happy too! Here are a couple tips from James M Stephens at Florida University Extension: Tomato plants 4–5 weeks old grow and yield better than older transplants. He also says when setting your transplant into the soil, do not compress the soil around the roots; gently pour water into the hole to settle the soil around the roots. After the transplanting water has dried a bit, cover the wet spot with dry soil to reduce evaporation. Check! See Tomatoes at Cornell! Start seedlings indoors now for March/April plantings. If seeds and tending seedlings aren’t for you, just wait, get transplants and pop them right in the ground per their right times! Right now, from seed in the ground, sow beets, caraway, celery, carrots, chard, chervil, chives, collards, cilantro (coriander), dill, endive, fennel, garlic, kale, kohlrabi, leeks, lettuces, mustards, green onions, bulb onion sets, flat-leafed parsley, peas – mildew resistant varieties, white potatoes, radishes, shallots, spinach, and turnips. Get bolt resistant/slow bolt varieties, and especially heat and drought tolerant varieties. Along with deciding plant locations, get ready for Summer Gardening! Get netting or bendable wire like aviary or 1/2″ hardware cloth for bird protection. Install or repair pathways, berms. Lay in straw, boards, pallets, stepping stones. Compost! The amount of compost to use varies, depending on your soil’s condition, plant selection, compost quality, and availability. A guideline offered by Cornell University (veggies – bottom of Pg 4) says use 3 inches over the surface worked into the top 3-6 inches of soil! Add 25% worm castings. As little as 10% works. They are potent – increase germination, faster seedling growth, help with plant immunities to disease. Adding guanos high in P, Phosphorus, at planting time helps your plants continue to bloom LATE in the season! Jamaican bat is high P phosphorus (blooms) 1-10-0.2. Sprinkle with a tad of coffee grounds to reduce fungal rots and wilts!! Grounds are more potent than they have a right to be! 0.5%, that’s 1/2 a %, or less is all that is needed or wanted! Don’t cover with mulch unless you need it for erosion control. Covered soil is cooler. Let your winter cool soil warm up. Do mulch under broccoli and kale you will be keeping over summer. They do best with cool conditions. Water your prepped areas when you water your other veggies. Moist, not flooded, soil is rampant with soil organisms enriching your soil for free! One more round of green manure is doable where you will plant late April, May. Grow it where you will grow heavy summer feeders like tomatoes, potatoes, eggplants, peppers, chilis, squash, pumpkins, cucumbers, melons, and corn; hungry stalk vegetables like celery, fennel, rhubarb, and artichokes; or continually producing green, leafy vegetables like lettuce, spinach, Swiss chard. Green manure can be beautiful favas, bell beans, or a vetch mix to boost soil Nitrogen. Favas are big and you get a lot of green manure per square foot. With our warming weather, longer days, your green manure will grow quickly! As soon as it begins to flower, whack it down, chop into small bits and turn under. It’s more tender to chop while it’s smaller. Taller is not better. It takes 2 to 2 1/2 months to grow. Cut and turn. Wait two to three weeks then plant, plant, plant! Sidedressing! Hard working plants need fuel and water. As broccoli starts to head, give it a fish/kelp tonic or compost/casting/manure tea! After the main head is cut, your side shoots will flourish!Pests! Pull away those blotchy sections the leafminers make on chard and beet leaves. Remove whole leaves that are too funky for rescue. Harvest the bigger outer lower leaves more often to stay ahead of the miners. Rather than row plant, interplant here and there. Water a tad less so leaves are less soft and inviting. Aphids Watch for leaves unnaturally curled along the length of the leaf, particularly broccolis, cauliflowers, kale, cabbages. Hose aphids off chard, kale and brocs. Keep doing it for a few days to catch the ones you missed. A little less water. For hard to get at places, down the centers of chard, crinkly kale leaves, get out that spray bottle! Treat once, wait a couple days, treat the ones that got away and newborns. I tried it, it WORKS! The simplest is to spray with 2 Parts alcohol, 2 parts water, 1 part soap. DO NOT use on seedlings, it will kill some of them. Spritz lightly rather than drenching or you may kill your bigger plant too! White flies Flush away, especially under the leaves. Remove any yellowing leaves, especially on your Brassicas, that attract white fly. Again, a little less water.Prevention A frustrating typical disease is Powdery mildew. It’s common on Curly Leaf kales. Plant leaving plenty of space for air circulation. Apply your baking soda mix. Drench under and upper sides of the foliage of young plants to get them off to a great start! Do this the same or next day if transplanting. A super combo is 1 regular Aspirin dissolved, a 1/4 cup nonfat powdered milk, heaping tablespoon of baking soda, a teaspoon liquid dish soap per gallon/watering can. Reapply every 10 days or so, and after significant rains. Not only is prevention so much better than after mildew has set in, but this mix stimulates your plant’s growth! See Aspirin Solution. Soil Checks! Especially after our recent rains, check beets, carrots, radish, potatoes, turnips, in general, for low soil. Soil naturally compacts with watering. Some of these veggies naturally push right up above ground as they grow. Planting their seeds deeper doesn’t compensate. It’s the nature of the veggie! Never hurts to put a handy little pile of extra soil near where you plant them. Cover their exposed shoulders to keep them from drying, getting tough, needing peeling, losing the nutrients in their skins. Uncovered carrot shoulders don’t ripen but stay green. Same with potatoes. Watering & Weeding is important after rains. Winds dry soil quickly and short rooted plants like peas, or seedlings, need to be kept moist. Thinning is a form of weeding! Thin plants that need it, like beets that naturally start in foursomes! Thin plants you intentionally over planted – carrots, beets, turnips, kale, chard, mustard! If you planted too close together, take out shorter, smaller weaker plants. They are all great in your salads along with small tender Brassica leaves. Dust Mulching, cultivation, breaks up the soil surface, keeps water from wicking to the surface and evaporating. If you use a hula hoe you do two things at once! Just a half to one inch depth cuts off weed sprouts. Indeed, it turns the soil a tad, all that’s needed. More weeds will follow, but it’s quick and easy to repeat the process. Two, three times, a few days apart, and there will be little weeds after that for awhile. Get ’em while they are small and easy to do. Smart gardening. 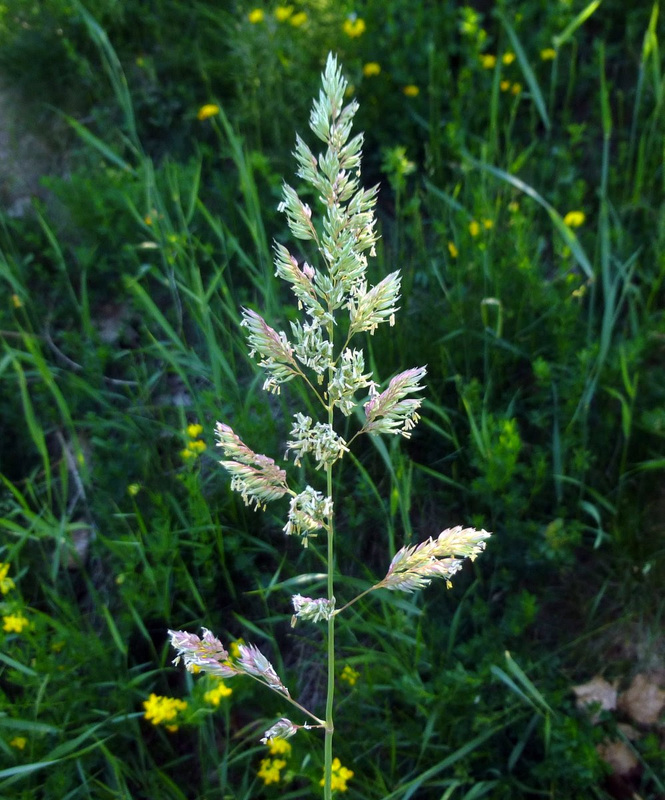 When grass has those frilly little green tops, it is blooming and seeding! Remove it ASAP. Better yet is to remove weeds before they seed! If at the seeding stage, gently pull, don’t shake the soil loose from the roots and spread seeds all over, and don’t put them in your compost! Have a wonderful February! May your seedlings grow well! January, Soil, Planning and Seeds! Delicious winter garden harvests continue! You may not feel like eating salads in this cooler time, but veggie soups and stews are super nutrition and great for sharing! Keep an eye on weather reports! We are still in the frost – freeze time in Santa Barbara until the last average frost date January 22 – measured at the airport. Have old sheets, light blankets, old towels handy. If a freeze is predicted, for small plants, like tender lettuces, just lay tomato cages on their sides and put your coverings over them. Secure coverings well so wind doesn’t blow them around and damage your plants. Remove them when the sun comes out! No cooking your plants before their time! Dates vary from the coastal areas to the foothills, and our climate is changing generally to warmer, so these dates may not be viable guides much longer, if even now. Find out the frost dates for your Zip Code! See the details – Protect Your Veggies from Freezing! We have been blessed with recent rains, so this is easy time to weed, weed, weed! Do it before the roots get bigger and you lose your soil when you pull them out. Weed before taproots get deep and hard to remove. Get those clover roots out all the way down and before grass makes its frilly little seed heads. Remove any weed that is flowering, making seeds soon, first! Anything that is not seeding may be cold composted, or you can use them as mulch where there is bare ground not in your garden. January Plantings If you love your winter crops, and aren’t necessarily in a rush to do spring/summer, amend your soil immediately and plant one more round, from transplants if you can get them or the starts you have begun on your own. See December In cooler January weather, plantings will start slowly, but they will mature faster than usual as days get longer, temps are warmer. Most January plantings will be coming in March, April. That’s still in good time for soil preps in April for the first spring plantings in April/May. Plant MORE of these delicious morsels now! Arugula, beets, brocs, Brussels sprouts if you get winter chill, bunch onions, cabbage, carrots, cauliflower, celery, chard, culinary dandelions, garden purslane, kale, kohlrabi, head and leaf lettuces, Mesclun, peas, potatoes, radishes – especially daikons, and turnips! Continue to make the most of winter companion planting! Carrots enhance peas, onion family stunts peas. Cilantro enhances Brassicas and repels aphids on them! Lettuce repels Cabbage moths. Onions, leeks and chives help repel the carrot root fly. Carrots thrive when Cilantro, Chamomile, Marigold are planted with them. Companion planting is also a size strategy. Keep planting smaller plants, especially lettuce, on the sunny under sides of Brassicas! Take off a couple lower leaves to make room. Planting summer crops early isn’t always a gain. Even if the plant lives, some won’t produce fruit until they have enough hours of sun, and for some, warmth including day/night and/or ground temps. And some plants set in too early will never produce. That waiting time for enough sun, enough warmth, interrupts the plant’s natural cycle and the production window is lost. Better to pull and replant. Summer Garden Design is important right now! You can do diagrams on paper or just give it a good think to see if there are any changes this year, and carry it in your head. That layout is what you need to make your seed list! Seeds from catalogs, seeds from the Jan 29 Seed Swap! Catalogs give you the best selection and of plants your nursery doesn’t carry or isn’t able to get. Check for drought and heat tolerant varieties or look in southern states or world areas that have desert low water needs plants and order up! The seeds of these types may need to be planted deeper and earlier than more local plants for moisture they need. They may mature earlier. Be prepared to do second plantings and use a little water. See Choosing Seeds: Catalogs to Seed Swaps! Later January is time to sow for mid to late March early plantings. If you will be doing succession plantings, sow in succession! If those fail, it’s to the nursery you go for transplants! Avoid box stores that bring plants from elsewhere that may not be timely for your area. Select local nurseries that order conscientiously for local timing. Check at farmer’s markets, with local farmers to see what they plant when. Prevention A typical disease is Powdery mildew. Plant leaving plenty of space for air circulation. Apply your baking soda mix. Drench under and upper sides of the foliage of young plants to get them off to a great start! Do this the same or next day if transplanting. A super combo is 1 regular Aspirin dissolved, a 1/4 cup nonfat powdered milk, heaping tablespoon of baking soda, a teaspoon liquid dish soap per gallon/watering can. Reapply every 10 days or so, and after significant rains. Prevention is so much better than after mildew has set in. See Aspirin Solution. Aphids Watch for leaves unnaturally curled along the length of the leaf, particularly broccolis, cauliflowers, kale, cabbages. Squish or wash any or the colony away immediately, and keep doing it for a few days to catch the ones you missed. After that, water less so plant leaves will be less tender and inviting. Slugs, Snails When you put in new transplants, sprinkle a bit of Sluggo type stuff around immediately to keep snails and slugs from seriously damaging or disappearing them while they are small. Before you anticipate your seedlings coming up, sprinkle some pellets around the plant, along both sides of rows. That keeps the creatures from mowing them overnight, making you think they never came up! Do this a few times, and there will be no tiny vegetarian predators for a while. If you notice tiny children snails, lay down another couple rounds. Sidedressing Heavy leaf producers and big bodied Brassicas, may need a feeding now. Heading is your cue to help them along. If they slow down, or just don’t look perky, slip them a liquid feed that quickly waters into the root zone. Stinky fish/kelp is easy for them to uptake in cooler weather. Get your nozzle under low cabbage leaves and feed/water out to the drip line. Lettuces love manures. Compost and manure teas, fish emulsion (when there are no digging predators), pretty powdered box ferts, are all good. Use ½ the strength of your summer feedings. Slow release is a wise consideration. Worm castings, though not food, work wonders! Also, be careful of ‘too much’ fertilizer, too much water, that makes for an aphid tasty soft plant. That said, another way to get goodness to the roots is push in a spade fork vertically, wiggle it back and forth, remove the fork, pour your foods into the holes, close ’em back up. Soil organisms will get right to work, your plant will stay healthy and be quite productive! See December images at Rancheria Community Garden! See the entire January New Year Newsletter! January – Soil, Planning and Seeds! Easy to Grow Broccoli, the Queen of Brassicas! Make Soil for Spring Planting – Amendments, Castings, Teas! Events! TWO Permaculture Courses at Santa Barbara City College! January 29 Santa Barbara 9th Annual SEED SWAP! Happy New Year 2017 Gardening!